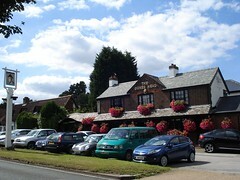 Large, friendly pub near Kingswood and Tadworth. It has a low ceiling and flagstone floor. Out the back, a covered patio leads back to a grassy beer garden. It's busy at lunchtimes (best to arrive well before 1pm if you want a table). On Kake's Tuesday lunchtime visit in August 2013 it was indeed quite busy; there were a few empty tables at 2pm (possibly helped by the good weather and many people being out in the garden), but customers were being warned that there was a half-hour wait for food. No music was playing on this visit, but there was plenty of lively conversation. Tables were cleared and cleaned very swiftly after being vacated. elvum noted in December 2007 that there are always a couple of big-name real ales on tap, averagely kept, and this appears to remain roughly true six years later. On Kake's August 2013 visit, the ales were Hogs Back TEA, Young's Bitter, London Pride, Gale's Seafarers, and their Greene-King-brewed house ale, Duke's Head KT20 (£1.75/half). The staff member who served me was pretty new and didn't know anything about the ales, but a colleague prompted him to offer me a taster of the KT20 when I asked about it. On elvum's visits (most recently in December 2007) the food has been quite good, and served in ample portions. elvum particularly recommends the burgers and the smoked salmon tagliatelle (about £7 as of December 2007). Kake's verdict: Seems to be fairly food-led — while sat at a table with my beer reading a book, staff asked me twice if I was planning to eat. I'd come back if I was in the area, though, whether to try the food or just for a pint. Accessibility: Two steps to get in at the front. Once you're in, it's step-free to the toilets (including an accessible one). There's no step between interior and the patio, so there may be step-free access from the street via that way. The pub has off-road parking. Last visited by Kake, August 2013. Last edited 2013-08-22 15:55:49 (version 6; diff). List all versions. Page last edited 2013-08-22 15:55:49 (version 6).